The Alda 103 is a favorite of mine (it’s a tranceiver from the seventies, that covers 80/40/20 or 80/40/15 on SSB and CW, and is entirely analog. 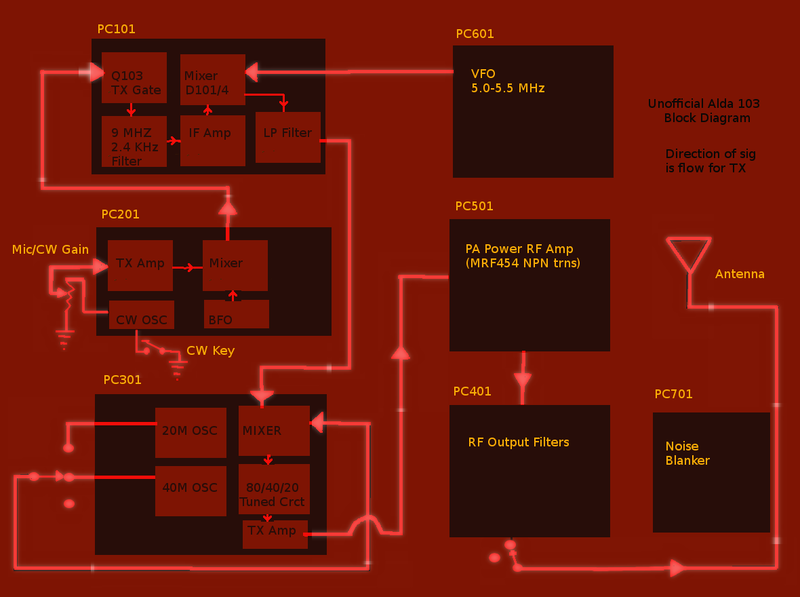 I’ve worked up an “unofficial block diagram” for it – since its creators are, sadly, no longer here to create a colorful, official one. Forgive the crude Gimp drawing. I think it works in a pinch. 11.0 MHz - 3.9015 MHz = 7.0985 MHz. where 9.0015 MHz - 5.1 MHz = 3.9015 MHz, as used in the preceding line. The 9 MHz signal in the 9 MHz, 2.4 KHz (bandwidth) filter derives from circuit board PC-201, from a BFO oscillator operating at 9.0015 (sideband 1) or 8.9985 (sideband 2), which itself has been mixed by the PC-201 board mixer with the audio source (voice audio or a fixed 800 Hz CW tone). The VFO range is 5.0 to 5.5 MHz, which explains why the Alda will receive 200 extra KHz of bandwidth above the 40 meter band (and other places as well). It tunes just slightly below the 40 meter CW band edge at 6.9985 MHz, when the VFO is at 5.0 MHz. The accessory plug on the rear panel has a jumper from pin1 to pin3. This connects the internal VFO on pin 1 to the input of circuit board PC-101 (pin 3). If the jumper is removed, an external VFO can supply the 5.x MHz signal, putting it between pin 3 and pin 2 (GND). The final transmit frequency signal is routed from the TX amplifier on circuit board PC-301 to the PA final amplifier board (on board PC-501) where it is amplified by a pair of MRF-454 NPN power RF transistors. This output is fed into the PC-401 board, where it is again filtered, and then is routed through the T/R transmit/receive relay to the antenna. The TR relay is at the bottom of PC-401, but I forgot to mark it with an annotation. The band switch connected to circuit board PC-301 brings in an 11 MHz oscillator for 40 meter band operation, and an 18 MHz oscillator for 20 meter band operation, and is not connected (NC) – for operation on the 80 meter band. If one does the math, it can be seen how this works. The more I delve into the Alda 103, the prettier it becomes. It is starkly simple in concept, requires very few discrete, primative devices from a bygone era to work, and work well. It has a 9 MHz, eight pole filter that is used on both transmit and receive, which in a bygone era might have required acquisition of expensive Collins gear to have. The resulting sideband signals are well skirted, and fall within 2.5 KHz for a sharp communications style sound. The Alda 103 is a product once made by the ALDA company. The company no longer exists, but the legacy lives on in the hands of the few, lucky Alda 103 and Alda 105 transceiver radio owners. Neither this website nor its author have an official connection with any of the old Alda enterprises, people, or property. Note: the author does not have a recent, applicable formal background in circuit building, or battery related issues, so this is presented as the work of a hobbyist, and is not meant for duplication by others. Readers should look elsewhere for design advice and info.